February 10 is National #UmbrellaDay! Rainy day scenes are staples in anime. Think about how undramatic it would be if a shoujo couple never got to share an umbrella in the rain, or how boring would fights be without dramatic lightning flashing in the background. Rain is a great plot device, but sometimes we forget about the star of the scene: the umbrella! 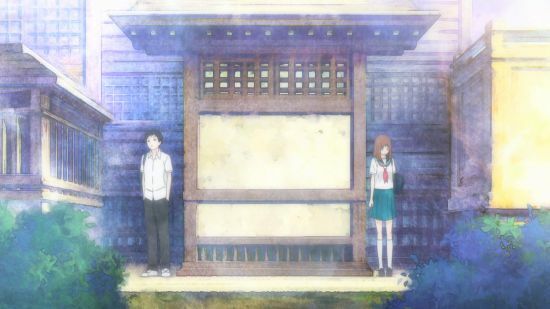 Blue Spring Ride – No Umbrella? BOOM! Romance! It’s the lack of an umbrella during a surprise rain shower that leads to a blossoming crush. Where would a shoujo heroine find herself without some rain and being in the right place at the right time? Maybe the key to finding the love of your life is to never buy an umbrella? 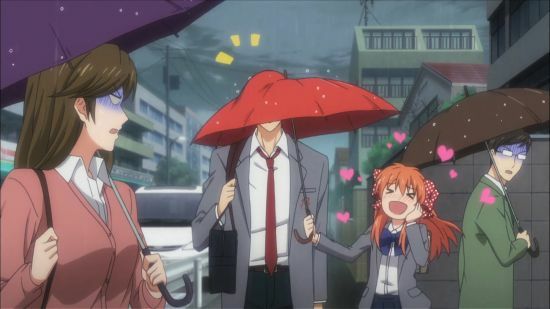 The umbrella might as well be another character in the awesome Monthly Girls’ Nozaki-kun ensemble. 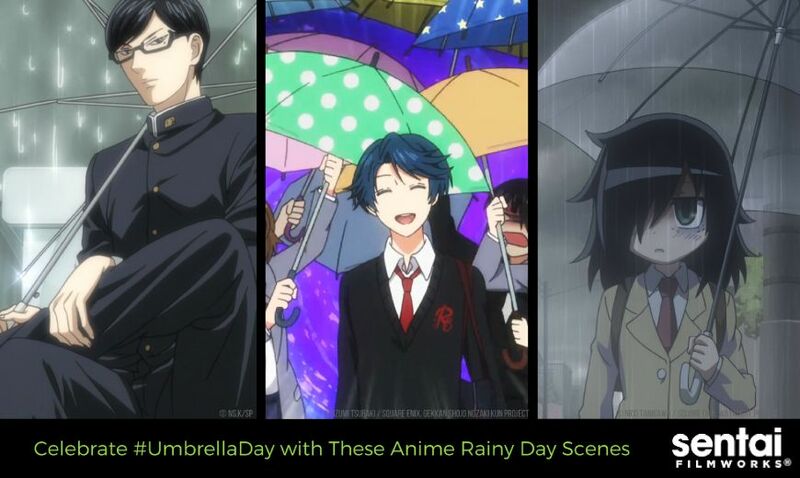 We got to explore every anime rainy day scene trope in one episode, for example, Sakura and Nozaki fail at umbrella sharing, and Kashima goes home sheltered in a fan-girl umbrella mushroom. 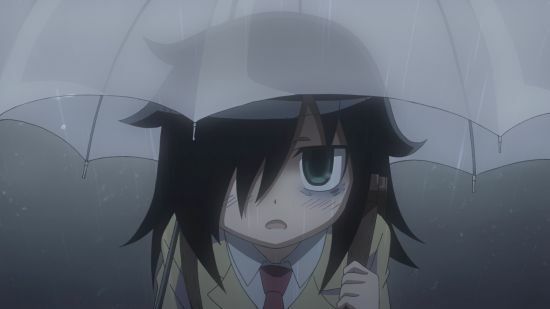 Kuroki gets caught in the rain with two other guys her age, and the three take shelter beneath a bus stop canopy. Is romance brewing? Will this classic shoujo event launch the socially awkward and withdrawn Kuroki into popularity? Probably not: but it’s worth noting that she does get a free umbrella out of the adventure! Clearly, the rain is a backdrop for feats that can often only be accomplished in anime. 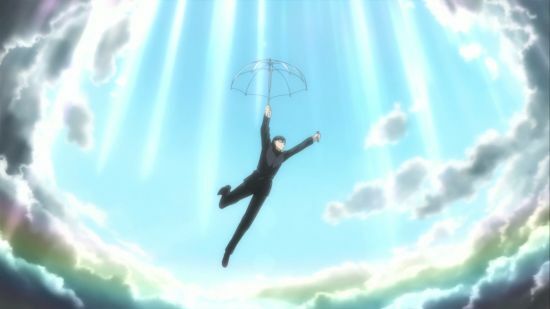 Sakamoto’s umbrella work not only helps him save a poor bird, but helps him descend with style that would likely make Mary Poppins proud. Ehhhh! Have you ever walked home in the rain with a crush? 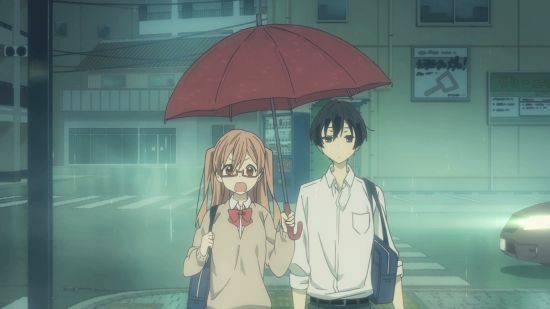 Shared an umbrella in an anime-esque way? Tell us about your umbrella adventures or possible rainy day scenes on Facebook, Twitter, Tumblr, and Instagram!